Ugh I’m sure I’m not the only one that has this issue. So before google drive, and friends were a thing, gmail gave us 1GB of mail space (at the time why it was called ‘G’ mail). And what better way to make files available between machines than to email them to yourself? As a security measure to prevent potential viruses, Gmail doesn’t allow you to send or receive executable files (such as files ending in .exe). Executable files can contain harmful code that might cause malicious software to download to your computer. 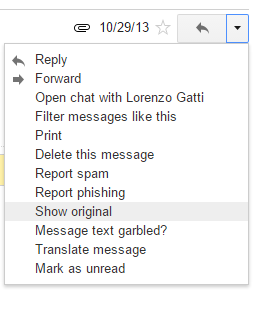 In addition, Gmail doesn’t allow you to send or receive corrupted files, files that don’t work properly. Well isn’t that great. Of course when I’m uploading source I tend to include executables, custom batch scripts to either clean or prepare, and sometimes run whatever it is I’m doing. Perhaps libraries, jar’s and maybe even device drivers. This lets you view the email in it’s un- formatted state, which also includes the attachments! So from here it’s a simple matter of saving the file to your hard disk. It is important that you ONLY save the base64 portion not that headers. I guess this is a pain for multiple attachments as b64 doesn’t read MIME containers. And this will (blindly) decode the attachment.b64 into output.7z. And from here you can extract the file without any issues. 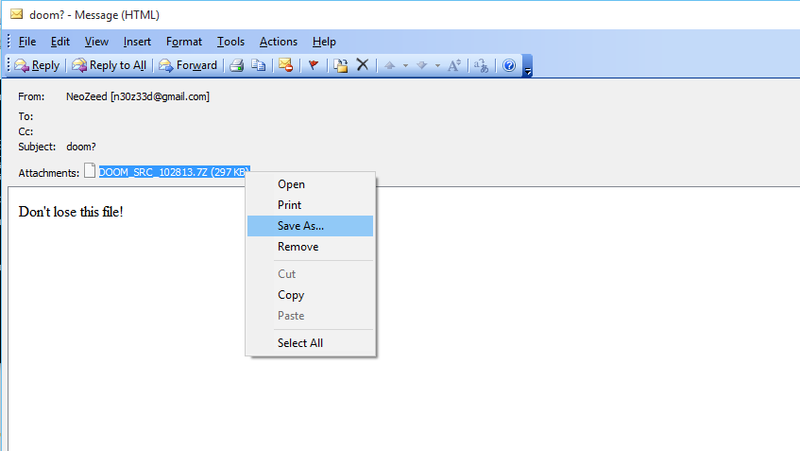 As a bonus, if you have Outlook, you can just save the entire file as an .eml and open it in Outlook! Also for Outlook 2003/2007 users you may have to use this registry alteration to have them support directly loading of .eml files. So, call me crazy, but I’ve been running an Exchange 5.5 server a home for a while without issues. It’s perfect for a single user, I can keep up to 16GB worth of email on there, and best of all I can use real email clients like Outlook (or is it LookOut!?). Anyways I noticed something weird which is that Outlook 2003 always is unsure if the server is there, and I have to tell it that it’s OK to connect. Also once the Outlook 2003 client connects, it kills OWA, giving me these weird ASP 0115 Unexpected errors. googling around for a fix was a bit futile, and I’d largely written off OWA, as in this day & age, who really wants some ASP 3.0 app? But for some reason, today was going to be the day to fix it, as I don’t have Outlook on my macbook air. So with the Outlook 2003 clue in mind I finally found KB-818709, aka “Outlook Web Access stops responding when you try to access a mailbox on an Exchange 5.5 computer”. This problem occurs when you try to access a user account that was previously accessed by a client computer that is running Microsoft Office Outlook 2003. Outlook 2003 adds a fourth entry to the PR_FREEBUSY_ENTRYIDS property. PR_FREEBUSY_ENTRYIDS is a multi-valued MAPI property that is stored on the Inbox folder. CDO expects three entries. The unexpected fourth entry causes heap corruption that causes OWA or the third-party program to stop responding. So with the hotfix in hand, and a reboot, it now works perfectly, like it did back in 1997. And the best part is that it works great in Chrome. And for anyone crazy like me with Exchange 5.5, remember to install SP4, and of course the KB829436 hotfix! Running Microsoft Exchange from home. Well thanks to my latest outage, I’ve gone back from having an Exchange server in the “cloud” (well really a server I rented), to a Virtual Server at home. First my ‘plan’ is to get a VPS that I can run OpenVPN on. From there I’m going to build a VM at home that will also run OpenVPN, and it will connect to the VPS. I will then setup routing, so that the Exchange server can then communicate with the VPS’s internal interface, and the VPS can communicate directly with the exchange server. I’ll then configure postfix to store & forward email to the Exchange server. This way if the link drops, the VPS will just spool the mail. Finally I’ll setup SpamAssasin to filter out the SPAM. First you will need to have a tun0 interface in your VPS. Almost everyone supports this these days so it shouldn’t be too hard… If you cannot get a tun0 interface, perhaps ppp0 with pptp..? I followed these instructions on setting up OpenVPN on Debian 6. Now granted, I’m using Debian 7, but the instructions are pretty much the same. Basically you have to setup a CA (Certificate Authority), and then you generate a Server certificate, and a client certificate. For my needs, I’m going to issue single certificates for everything(one) that connects into my VPN. I also have a network at home that I want routed to the VPS, so this is included (192.168.0.0/24). In the directory /etc/openvpn/ccd on the server, I have to ensure that I have a file called ‘homefw’ which is the common name of the client certificate. It has to contain the following line to ensure that my home network is routed to the VPS. Don’t forget to turn on ip forwarding on both the VPS, and the local ‘tunnel router’. For Linux based stuff you need to make sure that “/proc/sys/net/ipv4/ip_forward ” is a 1. You can just do a simple “echo 1 > /proc/sys/net/ipv4/ip_forward ” in “/etc/rc.local” or go through your distributions networking documentation to make sure you set it up ‘correctly’. If you don’t have routing in place you’ll notice that you can only ping the tunnel interfaces, but not the IP’s on the LAN. While this may be fine for a p2p or client setup it isn’t good enough if you want to route traffic. I’m running VMWare ESXi 5 at home, and thankfully it does support Windows NT 4.0 Server out of the box. I setup a Domain Controller running DNS & WINS. The VMWare tools won’t work properly with some service pack (4 I think?) but I went all the way to 6, along with the rollup.  Until you load the service pack, the network adapter will *NOT* work. I’m going with Exchange 5.5, so again I installed another NT 4.0 server, service packed it, and joined it with the domain controller. Remember to install IIS, and the ASP update, as 5.5 OWA needs asp. Be sure to apply the latest service pack for Exchange, SP4 – in the case of Exchange 5.5 . Now for routing I could go with dynamic routing, or static routing. I chose static as I didn’t want to get too involved for this project, as I needed to get email flowing as quickly as possible. It is imperative no matter what version of Exchange you run, that you turn off the open relay “feature”. A great step by step guide is available here on msexchange.org . 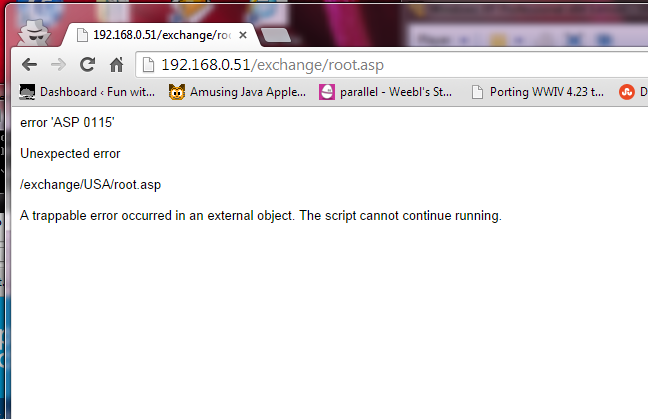 With the basic routing in place you should be able to talk to the Exchange servers’ SMTP engine. You may want to setup either a local DNS and populate the VPS’s source address or put in some host entries for it. Now it would be insane to place an Exchange server directly onto the internet. Plus when the VPN link is down, it’d be nice to have the VPS store email and forward it when it can. So for this task I installed postfix. This will permit my exchange server to relay out my VPS, and tell postfix that it’s OK to accept email for the various domains I have. And for domains I couldn’t be bothered to create mailboxes for, instead I have their email setup to forward to an existing box using a virtual domain in the ‘virtual’ file. Which isn’t too involved once you get the bits in the right place. Assuming you’ve got your MX records setup on the outside, with any luck you should start seeing some mail flow through. If not telnet to port 25 and start talking to your mail server. One problem I have is that superglobalmegacorp.com is an old domain, and it’s lapsed a few times to different idiots who not only added to the ridiculous spam lists I’m on, but also spammed from it as well. So to deal with SPAM, I went ahead and installed spamassassin, as described in this page. As I do get a lot of spam. I don’t think most people will care, but this is more so for me keeping my notes straight. So yeah I run Exchange 5.5 at home (which I got on ebay for $25!) with Outlook 2003 on Windows XP x64. It works well enough for me. Author neozeedPosted on May 7, 2014 September 14, 2014 Categories email, Exchange, interenet, microsoft windows, virtual networking, Windows NT 4.010 Comments on Running Microsoft Exchange from home. Like all things Microsoft it’s scattered in 320 places.